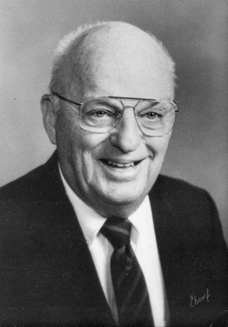 Dan O’Brien joined the Fenwick faculty as a physical education teacher and athletic trainer as soon as he graduated in 1934. In 1937 he became freshmen football coach and during his 34 years coaching football, the freshmen Friars compiled 20 undefeated seasons. In 1943, he became head swimming and diving coach, and for the next 28 years, his Fenwick teams never lost a meet in Chicago Catholic League competition. Under his leadership, Fenwick won the league championship more times than all other members of the league combined including 23 consecutive CCL championships. O’Brien coached 74 All-American swimmers or divers. Dan also coached diver Ken Sitzberger, a gold medalist in the 1964 Tokyo Olympics. After retiring as swimming coach in 1965 and football coach in 1970, Dan continued as athletic trainer and became Athletic Director in 1976, a post he held until 1989 when he became Athletic Director Emeritus. He continued in that position until his death in 2003.